Revenue in the Milk Products segment amounts to US$83,183m in 2019. The market is expected to grow annually by 1.7% (CAGR 2019-2023). In global comparison, most revenue is generated in United States (US$83,183m in 2019). In relation to total population figures, per person revenues of US$252.76 are generated in 2019. The average per capita consumption stands at 88.7 kg in 2019. The Milk Products segment covers all types of dairy products which play a major role in the daily diet of many consumers. In addition to drinking milk, the segment is split into Yoghurt and Curdled Milk Products, Cream Cheese and Cheese. Dried milk products such as milk powder are not considered here. The market for Milk Products tends to be characterized by saturation phenomena which could increase in the future due to a growing interest in milk alternative products such as soya milk. This development will encourage further consolidation of the dairy industry which is already under much pressure. The most important suppliers of dairy products in Europe are: Nestlé, Lactalis, Danone, Royal Friesland Campina and Arla Foods. Reading Support Revenue in the Milk Products segment amounts to US$83,183m in 2019. Reading Support The Milk Products segment is expected to show a revenue growth of 2.2% in 2020. Reading Support The average revenue per person in the market for Milk Products amounts to US$252.76 in 2019. Reading Support In the market for Milk Products, volume is expected to amount to 28,947.5 mkg by 2023. 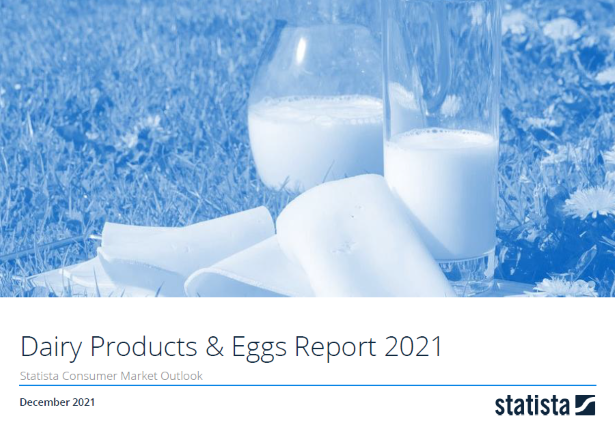 Reading Support The market for Milk Products is expected to show a volume growth of -0.2% in 2020. Reading Support The average volume per person in the market for Milk Products amounts to 88.7 kg in 2019. Reading Support The average price per unit in the market for Milk Products amounts to US$2.85 in 2019. Reading Support With a market volume of US$83,183m in 2019, most revenue is generated in United States. Here you can find more studies and statistics about "Milk Products".